Mike Brodzinski split his college hockey career with two seasons at Minnesota followed by two seasons at St. Cloud State. Hopefully he kept supporter apparel from both schools because he will need all of it now. On Thursday night, his son Michael, a junior defenseman at Blaine, committed to the Gophers. Older brother Jonny, a forward, previously committed to St. Cloud State and plans to join the Huskies next season. Michael picked the Gophers over Nebraska-Omaha. His short list of schools also included North Dakota and St. Cloud State. Brodzinski, who measures 5-11, 180 pounds, scored 14 goals and added 17 assists for the Bengals last season. He scored an overtime goal in the section finals to send the Bengals to their sixth consecutive Class 2A state tournament. Brodzinski emerged as one of the state’s promising young defensemen as a sophomore last season. USA Hockey officials also noticed, offering Brodzinski a spot on the National Team Development Program Under-16 team. 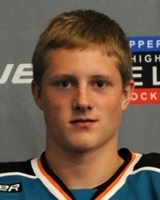 He elected to return for his junior season at Blaine and has been playing in the Upper Midwest High School Elite Hockey Hockey League this fall. Brodzinski scored five goals and added 11 assists in 23 games for Team Northwest, and was selected to play in the Elite League's Bauer National Invitiational Tournament Nov. 4-6 in New Hope. Mike said the future is uncertain but Michael has the option to play in the USHL at some point or remain at Blaine through his senior season.